Understanding atheism as a moral system. The suspicion that atheists have no morals is ironic, given what historians have learned about atheism in the United States. Science, from the discoveries of the Enlightenment to Darwinian evolution to the arguments of the New Atheists, has provided a justification for rejecting the intellectual claims of religion. More important, though, is morality, which has often been the underlying motive that led people to deny the usefulness of religion. Listen carefully to the debate on contemporary issues such as abortion and gay marriage, and you will hear moral reasoning on both sides; when atheists, agnostics, or "nones" take a position, they do so out of a conviction that their morality is superior to that of traditional Christianity. So too in the 19th century, a variety of moral issues, notably slavery and women's rights, led some people to reject the Bible and evangelical Christianity in pursuit of a more enlightened morality. (See, for example, James Turner, Without God, Without Creed: The Origins of Unbelief in America [Johns Hopkins Univ. Press, 1985]; David Hempton, Evangelical Disenchantment: Nine Portraits of Faith and Doubt (Yale Univ. Press, 2008). Given this contradiction, Peter Watson's The Age of Atheists: How We Have Sought to Live Since the Death of God provides a welcome opportunity for understanding atheism as a way of life—even as a religion. Watson, a British historian of ideas, begins his historical account with Friedrich Nietzsche's 1883 pronouncement that "God is dead." Watson recognizes the death of God as both a historical and a contemporary problem. Nietzsche's dictum gained such notoriety because the conditions of life in the West near the start of the 20th century permitted some people to imagine the possibility of a way of life apart from theism. Watson's history charts how atheists attempted to live the good life while coping with the new vacancy opened up by the felt absence of God. Watson also recognizes the need for a moral guide as a contemporary problem for atheists. 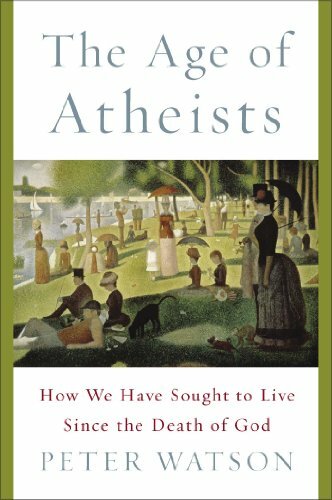 In providing his intellectual and cultural history of how atheists have lived, he hopes to provide a guidebook for atheists today. In this history of atheism since the 1880s, Watson focuses on people who felt the need for religious experiences apart from theism and the supernatural. He draws on Ronald Dworkin's Religion Without God to distinguish between the "scientific" claims that religions make (what Christians would call theology and history) and their claims about "values." He dismisses the "scientific" claims of religions and doubtless many of the specific value claims of religions. But Watson thinks that the theological claims of religions do not really connect to their value claims. Though Science and Reason might disprove theistic religions, they do not do away with the need for religion itself. It is possible and desirable to have a religion apart from God. Concerning the form and content that an atheist way of life might take, Watson's resounding answer is art. His book is about how "philosophers, poets, playwrights, painters, psychologists … have all sought to think through just how we might live, individually and communally, when we have only our own selves to fall back on." Your comment that the author "limited his study mostly to atheists who felt the need for a non-theistic religion" was helpful. Within that group the reason for the non-theistic constraint is what intrigues me. Within the implied other group of atheists there is another story, which seems to relate to the value given human life. Thanks for a sympathetic review. Many thanks for this thoughtful, well written review, Dr Mullen (I trust it is now Doctor - or will be very soon). Also, congratulations on your appointment at George Mason University.